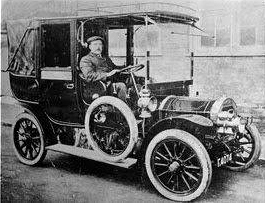 During the late 90s I discovered that the very first petrol taxi in Billericay came into town in 1910. 2010 is the 100th year since the introduction of the very first taxi in Billericay and I celebrated by actually locating a copy of the picture and having it positioned in the local pub, the Coach and Horses, which is some 150 yards away from where the original picture was taken. From my research into the original picture – the guy who is actually sitting in his cab was a Mr Edward Ball and the actual taxi itself was 12/14 horse power with a top speed of something like 30 miles an hour max. In fact when I actually looked in to research the taxis called the ‘Unique Taxi’ it is a French taxi which ironically some 100 years later is exactly what I drive. I drive a Peugeot which is in fact also French. Having researched on the internet one of those taxis was still up for sale, probably about 2009; and there was also an item on Pathé news which had been shot somewhere in the 60s of one being renovated. The interesting thing about the taxi was that in the back of it was a set of compasses on the bulkhead so that when the passenger got in and said ‘I would like to go to…. North West London’ and the taxi driver started going via the South East to get to the North West of London, the compasses would show that he was going in the wrong direction and would allow the passenger to get quite irate with the taxi driver and say ‘you’re going the wrong way my man!’ Which I thought was quiet amusing, but to find out that there was actually a taxi still around last year – 2009! I think the most famous person I have taken is the rugby player who played locally originally for Barking - Jason Leonard. Another story which did happen to me a couple of years into being a cab driver – I’ve been a cab driver 12 years, was I was working in Basildon at the time, going down a residential street and I was flagged down by two guys in a car. I looked at them closely and they went ‘yes, it’s right, it is us we are Chas and Dave’ and it turned out that Chas and Dave couldn’t find a particular venue they were appearing at and I finished up actually taking them up to the venue. I said ‘follow me, I’ll take you up there’ and one of them said could you also direct us to the nearest hostelry so I went and had a Coca-Cola with them in one of the local pubs. Within recent years, when I initially started in the cab business, it was just me, myself and I, working as what they call a lease driver where you rent someone else’s vehicle. But gradually over a period of time I set the target of getting my own vehicle which I did, and then we moved on to the next stage. The next stage was actually to get involved with the formation of a co-operative, because these days the taxi industry technology has advanced so much. Gone is the need for the use of radios and we have things called GPS systems but in fact our service is based off the back of a call centre via the internet which is very, very economical to run and efficient. The connection with the Ivory Rooms (I believe it was Quilters school; originally it was actually turned into the Quilters nightclub with a school theme, then after that it went through to be changed to the Ivory Rooms) is that they were looking for branding with their products throughout the town, which they have been very successful at, but also, more importantly, to keep the local residents happy with regards to the fact that their club is based in a residential area. They wanted to quickly remove revellers from their club with the minimum of disturbance away from local houses and we’ve successfully managed to put that in place and long may that continue. Mr Edward Bull was my great great Uncle on my mother’s side. Nice to see him remembered here. His Father George Bull was a fly carrier (with a one horse cart) and Edward followed in his footsteps. Edwards sisters (Nelly and Nancy Bull) ran the tobacconist at 114 High street.